Belkin has produced a few baby gadgets and gizmos in the past, but the WeMo Baby has to be the most useful yet, because it’s a standalone device, which also allows you to also turn any smartphone into a monitor too. This is a great use of your mobile and means you don’t need any extra bits and pieces to keep a close eye on your little ones. To get started you simply connect the main component (the bit on the left) to your home wi-fi network and then download the WeMo baby app to your phone or even tablet, which you can then access wherever you have wi-fi or a mobile internet connection. It’s handy that you can also sync the base unit up to more than one mobile device, so two parents or a parent and a babysitter can all have access to what’s going on at the same time. There are more advanced (and expensive) options too for super anxious parents, like crying notifications and an analysis of how your kid sleeps, but we’d try the free version of the app to start with. 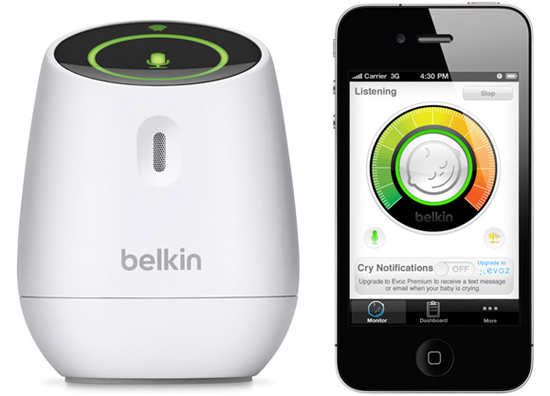 The WeMo Baby will retail for around $89.99 and is set to launch over the next few months, check out the Belkin website for more information.